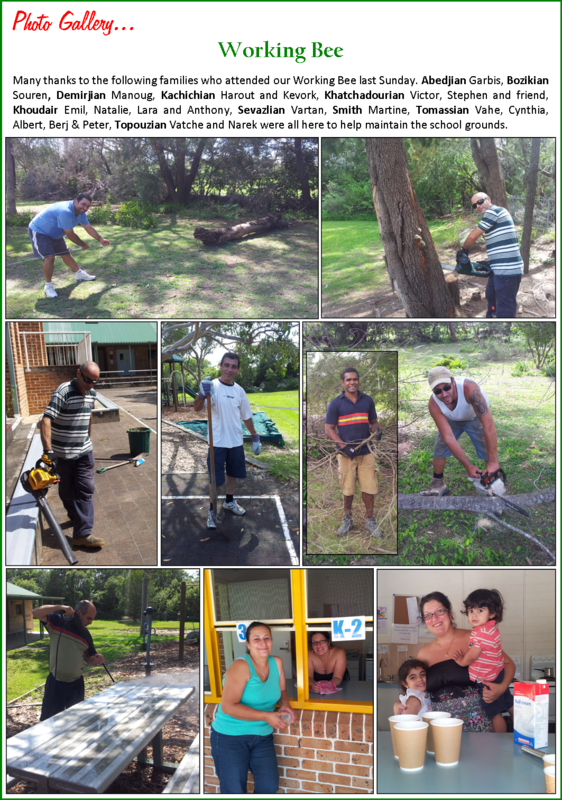 AGBU Alexander Primary School - Blog: WORKING BEE - THANK YOU! Thank you to all the families and friends who attended our Working Bee this Term. With our combined effort, we managed to remove the weeds and trim the plants in garden. The driveway and playground edges were cleaned and weeded out for a much tidier look. Trees were trimmed and dead ones along the edge of the property removed. Gutters were cleaned including the stormwater pits. It was also a good opportunity to fix the broken or cracked windows. As usual, the children provided help were needed. The grounds, in front of the classrooms and under the veranda were cleaned with pressure wash, including the aluminium seating and tables in the quadrangle. The covered area was also cleaned and the stage was setup, ready for our Easter concert. There is always a great feeling of community and a sense of satisfaction when our families get together, enjoy each others company and work for the good of the school in such a willing way. A note of thanks to Mr Garbis Abedjian, a former parent, who has been attending our Working Bees over the last few years and dedicating his special skills and volunteer time over numerous school projects. Thank You - heaps! !